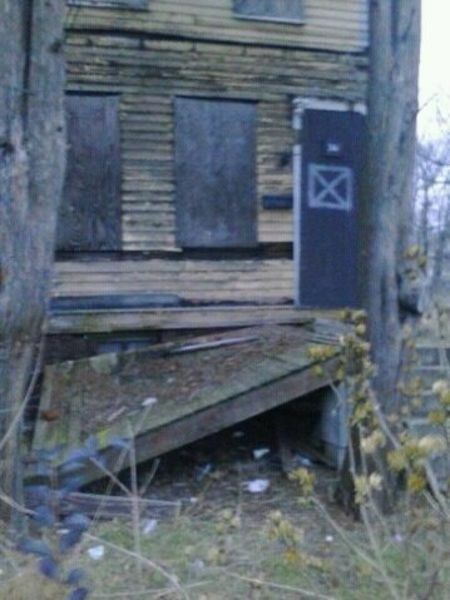 This house has been reported online since 5/22/2012 and according to City Hall this house is now owned by the city. This house until this day is in the same condition no one ever came out to clean it up. The front porch is ripped off and the grass is so high that it’s growing over top of the wood. The front yard is filled with trash and the grass is so high you can’t see down the street. The back yard has trash thrown in it and the grass is very high and the possums are continuously running out of the yard. The plywood that was on the side door is off so you have numerous visitors going in and out of the home. I don’t know what’s the use of submitting information online and nothing hasn’t been done about it in 6 years. After seeing this posting hopefully someone come out and inspect the property and have it cleaned it’s very unsafe. ABANDONED HOUSE HAS BEEN UNKEPT FOR 4 YEARS THE FRONT YARD HAS TRASH THROWN IN IT AND THE BUSHES ARE HANGING OUT ONTO THE SIDEWALK. THE FRONT PORCH IS PARTIALLY DETACHED FROM THE WALL AND CHILDREN BE RUNNING AND JUMPING OFF OF IT VERY DANGEROUS. THE BACK YARD BUSHES ARE EXTREMELY HIGH AND YOU CANT EVEN SEE OUT THE YARD. THIS IS MY 3RD TIME REPORTING THIS ISSUE AND NOTHING HAS BEEN RESOLVED I A RECEIVED A EMAIL INFORMING ME OF THE PEOPLE WHO THIS ISSUE WAS REPORTED TO AND STILL NOTHING HAS BEEN DONE. I AM BEGINNING TO BELIEVE THAT THIS IS A WASTE OF MY TIME. I agree the handicap parking sign need to be taken down so other people can use the space since the person house where the sign is has been deceased since 2012. I am wondering why is nothing being done about this issue if the email was sent to several departments. A DUMP HAS BEGAN TO APPERA. mULTIPLE GRABAGE BAGS IN THE LOT BEHIND CHURCH AT THE CORNER OF HERMITAGE AND WEST STATE ST.
it is run down about to fall down.Drugs are rampant.